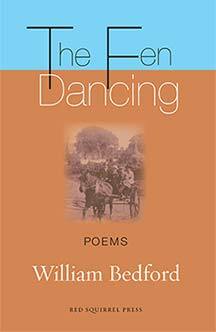 William Bedford's new collection begins with poems about his father's 1920s childhood in a remote farming community in Lincolnshire, and ends with the Manhattan skyline and the literary world of Greenwich Village. 'I was trying to imagine a lifetime of eighty years', Bedford says, 'beginning in a world of pony and traps and penny farthings and ending with men walking on the moon'. A ritual 'fen dancing' is at the heart of the volume: an annual sheep-washing festival ending with a dance and home-brewed wine in which it was difficult to tell if the fen itself was dancing, or the villagers were performing a dance of that strange name. I like the steady fall of fine snow. you wait for me to write this poem. I used to know where we were going. Lit candles to scare the night. Cast spells over the poisoned apples. Now I cannot turn the pages. has emptied the nest of meaning.